Crow Creek Golf Club is located just a few miles down Highway 17 from North Myrtle Beach and Myrtle Beach in the quaint fishing village of Calabash, N.C. This Rick Robbins design is one of the most popular Myrtle Beach golf courses among both locals and tourists since its opening in 2000. It is listed as one of the top courses you can play in North Carolina. 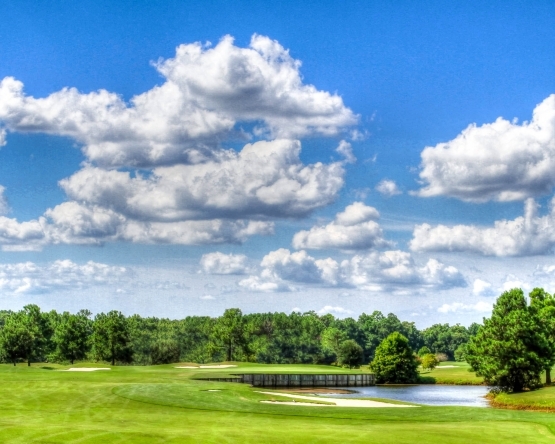 Robbins designed a beautiful course that incorporates the natural flat terrain on the front nine which was formerly a tobacco field, changes to a rolling terrain on the back nine. Strategically placed water hazards and bunkers make navigating yourself around this course fun yet challenging. Crow Creek is noted for its consistent and immaculate conditions. The beautifully maintained Bermuda grass fairways and exceptional V8 Bent grass greens will provide an outstanding Myrtle Beach golf experience. North Myrtle Beach is the ideal place to stay while including Crow Creek in your next Myrtle Beach golf package. You can stay in any of the beautiful North Myrtle Beach condos or North Myrtle Beach hotels, enjoy the beautiful North Myrtle Beach weather on its sandy beaches, enjoy the exciting North Myrtle Beach nightlife and visit any of the North Myrtle Beach attractions. It is time to book your Myrtle Beach golf package today! Played this great course and had a wonderful time. Greens in great shape, staff very courteous. Do not forget to add this course to your list of courses. It will become a favorite. I played Crow Creek yesterday and it was in very good condition. Unfortunately I got rained out after only 9 holes but look forward to playing it again.